Trina is artsy fartsy: My hideous paint palette! my set of fav. paintbrushes my "A-Team"
Today I figured I'd make a little post about my "traveling" painting kit. It's basically all my favorite paintbrushes and tools packed into one box that I can take with me anywhere. No biggie... most artists have a version of this. However, I have a very special ongoing project involving my paint supplies that I couldn't help but share with you guys... It's a masterpiece in the making! BEHOLD! My super gnarly paint palette, proudly never washed. I always get a lot of comments on this thing. Most people find it gross.. I can't imagine why! Will named his palette Benjamin. And about the mountain-like shape it's taking, he says, "That arch you see was at the request of my children constantly nagging me to sculpt some form into him - that took about 9 months." After seeing this post, I decided that I would start "growing" my own paint palette. By comparison, I still have a lot more layers still to build up before I'm anywhere near Terry's level. But it's definitely something to work towards. 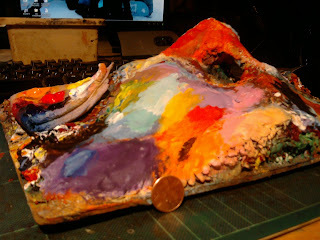 For the record, my palette is probably about three years old now. You can see the layers slowly emerging. Also, in its defense, it looks a lot grimier than it actually is. I use india ink often, so there's this lovely blotchy black glaze all over everything.. Here's the palette from the bottom. As you can see, I've completely filled up the original "wells" to the top, but evidence of their existence still remains underneath. GEROSS!! And by gross I mean.. AWESOME. I am often questioned about how I am able to use this thing without "mixing up my colors." I actually don't have this problem with my palette at all. Since I use mostly acrylic based paints, they don't run after drying. I just keep building layers upon layers on top of the older paint, like some sort of crazed mad scientist of paints. It requires you to never clean your paint palette, and serves as a valuable lesson in wastefulness. It's incredible to see how much left over paint will accumulate in time- seemingly wasted and unused. But a benefit of creating a crazy palette like this is that you have a chance to sort of build something completely new and unusual out of something that would otherwise be washed down the drain. Plus, it's a testament to your journey as an artist. Like Will Terry mentioned in his blog post- "[My Palette has] been to Maryland, California, technically Nevada and idaho, but mostly he's lived here in Utah. Like I said before of the thousands of paintings I've done he's got parts of all of them in him." you just made me feel bad for cleaning mine....i just decided to build up mine as well....yes,its kinda gross,but very interesting at the same time...see,i told you,you are a very inspiring woman....you help me in a lot of ways to grow to be more fun and creative...i am glad i stumbled onto your blog last year. The beginnings of something truly epic! Boho you inspire me by being inspired! :P Don't feel bad for washing your palette, start TODAY and the layers will just add up. Oh and Hi Will Terry!